Steph has another excellent giveaway at Adventures in Babywearing. It's sponsored by Baby Dagny, the online baby retailers who are coincidentally having a crazy clearance sale with many coveted items marked 75% off. The prize? 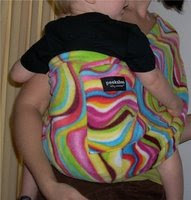 A gorgeous pouch sling from Peekaboo Baby Collection in sort of a multicolor Pucci-esque print. This style was exclusive to Baby Dagny but is now SOLD OUT, so here's your last chance to get one! Jasper is finally acclimating to the concept of being worn (he would much prefer I carry him in my arms constantly , so I am crossing my fingers that we win this one. Mommy needs the use of both hands, y'know. This contest post is AWESOME!! Thank you! 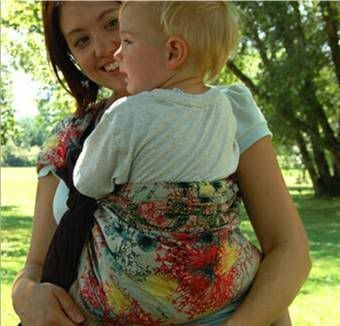 Good luck with the babywearing.